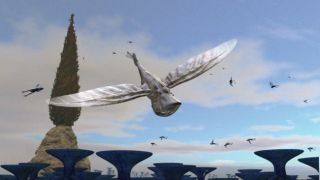 A skywhale is hunted by small, agile predators on Blue Moon, one of two alien worlds developed and populated by computer models and astrobiologists. There areno glowing fingers or Reese's Pieces in National Geographic's alien-filled 'Extraterrestrial,' but the message is clear: Earth is not that specialwhen it comes to developing life. The televisionspecial highlights two very different worlds from Earth, both teeming with lifethat astronomers believe could evolve if given the right set of conditions. Usingcomputer models and armed with basic evolutionary theory, the scientistsimagined not only what conditions might exist on their theoretical planets, butalso how life may interact with the environment to form a thriving ecosystem. "I've seena lot of aliens on the silver screen and [television] screen that, while theymay serve to be entertaining, are not very plausible," said Seth Shostak, seniorastronomer for the SETI Institute scanning the skies for signs of intelligentlife, in an interview. "Here was a plan to make aliens that make sense." It was thatconcept that drew Shostak, a SPACE.com contributor, to appear in the two-hourprogram which airs May 30 (National Geographic, 9:00 - 11:00 p.m. ET/PT). More than 130extrasolar planets have been found by astronomers, manyextremely massive and too close to their star parents to support life. Thegrand prize of planet hunters is the Earth-size planet in a comfortable orbitaround its star. Theproposed TerrestrialPlanet Finder, a two-telescope NASA project slated launch around 2014,could one day find those planets and peek into their atmosphere composition.But other space and ground-based telescopes will also join the hunt, includingthe Earth-size planet seeker Kepler slated for a 2008 launch and the SpaceInterferometry Mission to begin in 2011. Europe's Darwin and Eddington missionswill also hunt for other planets from space, while astronomers continue to seekthem out from terra firma. Both of theplanets visited in 'Extraterrestrial' are within about 50 light-years of Earth. Aurelia, anEarth-sized planet tidally locked with its stellar parent, presents one fixed facetoward a warm reddwarf and it is there - not the perpetually frozen waste that never seessunlight - that life thrives. Meanwhile, Blue Moon, which orbits an enormousgas giant that is itself orbiting a binary star system, is covered inlife-giving water and an atmosphere so dense that enormous winged Skywhales cantake flight. Gems suchas the sheer oddity of Blue Moon's orbitalgeometry, or the hazards of Aurelian life due to constant bombardment frompowerful solar flares thought to be a red dwarf star's signature, draw theattention but are too few in the beginning. While slowto start, 'Extraterrestrial' presents an intriguing, if somewhat conventional,view of how life might evolve on an extrasolar planet. The researchers admit asmuch by focusing on water-bearing worlds and carbon-based life systems. "It'sconservative, in a sense, to focus on carbon-based life," Shostak said, butadded that water may always be a good indicator of habitable planets. "NASA'smantra is follow the water, and I think that was sort of our mantra too." NASA's Marsrovers Spirit and Opportunity, for example, were sent to two specific areas onthe red planet to hunt for signs of water. Opportunity found evidencethat its Meridiani Planum landing site was once drenched in water, while Spiritfound signsthis week pointing to a wet and violent past at Gusev Crater. Unlike theDiscovery Channel's 'Alien Planet,' which used the alien artwork of WayneBarlowe to demonstrate the mechanics of how smart robotic probes might explorea distant world, 'Extraterrestrial' extrapolates otherworldly animals andplants using analogues found on Earth. Eyes, forexample, have evolved several times on Earth and are likely to pop up on otherlight-filled worlds, researchers said. Other sensory organs will likely alwaysbe near the brain for better information processing and even the appearance of 'Extraterrestrial'creatures, including an emu-like, two legged Aurelian beast dubbed a Gulphog,are based on rules fauna follow on Earth. "ThatGulphog looks like some cross between an ostrich and a dinosaur," Shostak said. "But these shapes are not completely random and [on Earth] nature has happenedupon them over and over." No matterwhat the form it takes, odds are humans will at least take more than a passinginterest should alien life prove a reality. A NationalGeographic-commissioned telephone survey of 1,000 Americans found that 60percent believe life exists on other worlds. About 90 percent of those whobelieve in extraterrestrial life thought the Earth should respond to anycommunications emanating from an alien planet. Just besure to have your Reese's Pieces handy when they come calling. NationalGeographic's 'Extraterrestrial' will appear on the National Geographic Channelfrom 9:00-11:00 p.m. ET/PT. (Check local listings).